Wonderware: Why alarms are a double-edged sword? Alarms, if not managed properly, could prove to be your Achilles’ heel. Since the introduction of Distributed Control Systems (DCS) in the late 1970s, the number of alarms per operator has gone up dramatically. Many Operators today are inundated with thousands of alarms on a daily basis, which is much higher than industry accepted guidelines. 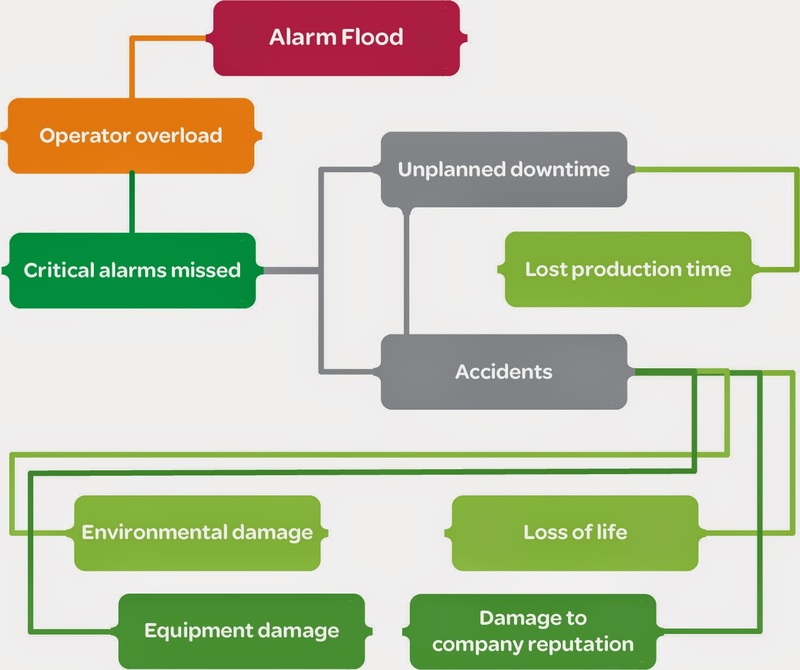 Too many alarms with little or no contextual information can hinder the operator’s ability to quickly distinguish the most critical alarms from the routine process alarms, thereby increasing the risks of potential plant damage or personal injury. As a matter of fact, alarm floods have been identified as one of the key contributing factors in a number of industrial incidents. Too many poorly prioritized alarms were one of the main reasons behind the 1994 explosion and fires at the Texaco Milford Haven refinery; operators had to analyze and address 275 alarms in the last 11 minutes before the explosion. Sometimes insight into the solution to a problem lies within the problem itself. Such is the case with alarms. Significant and numerous leaps in Automation technology innovation from the 1970s to present brought more accessible information per sensor or actuator, which resulted in more alarms per device. In addition, the use of software in manufacturing made the process of configuring alarms very easy and cost effective. Since there was virtually no real cost in engineering or operating time to add alarms, people started adding alarms at the drop of the hat, without putting much thought into the context, needs and dynamic nature of plant processes. 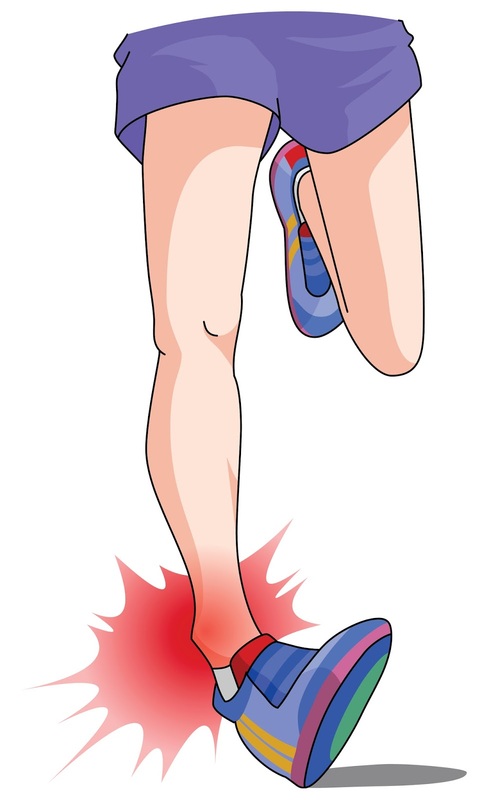 And, slowly this trend became a sort of belief–a false belief actually– that ‘more is better’ and nothing can go un-noticed if everything has an attached alarm. 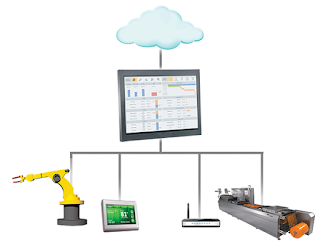 Effective alarm management is the key to plant safety, productivity and profitability. Many manufacturing facilities, however, do not pay enough attention to alarm systems and rarely implement well-defined strategies for alarm management. In most cases the approach remains reactive rather than proactive. Although ROI on alarm management may not be immediately visible, its long-term returns can be quite substantial and the potential for negative impact to a company can be dramatic as demonstrated in the below diagram. Studies show the United States petrochemical industry suffers a loss of 10 to 20 billion dollars annually due to preventable abnormal situations. Poorly designed alarm systems can negatively affect plant performance, profitability and safety. One missed alarm can cost millions of dollars in production losses, equipment and environment damage, and loss of life. BP’s Texas City Refinery explosion of 2005 was one such example, where defective level alarms and poorly designed alarm system were one of the main reasons behind the deadly explosion and fire that killed 15 people and injured 170 more. As seen in the diagram below, the price to pay for poor alarm management can be very high. Alarms are basically meant to alert operators so they can minimize incidents, but sometimes alarms become a key contributor to these incidents. Nuisance alarms, standing alarms, fleeting alarms, alarm floods and alarms with wrong priority all contribute to operator stress and confusion, and thus increase the risks of accidents. Alarm system management is an important operational tool that helps plant operators to focus only on the most important alarms and important conditions, thereby improving the effectiveness of operations and reducing the risks of downtime and industrial accidents. 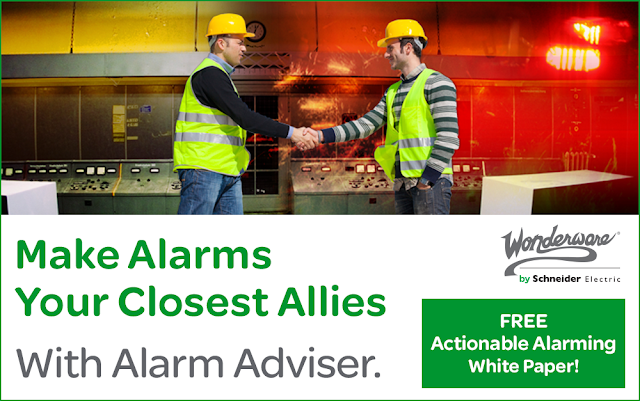 Alarm analysis software such as Wonderware Alarm Adviser can be of great help to benchmark the existing alarm system, identify nuisance alarms, define KPIs and create dashboards to maintain performance over time. However, companies must understand that alarm management is neither about software nor one-time project implementation; it is a journey toward continuous process improvement. In the future blog posts we will dig deeper into nuisance alarms and industry standards on alarm management. What are your concerns regarding alarms? Do you have a strategy in place for alarm management? Let us know your thoughts in the comments section below. Special thanks to Suman Singh (sumankumar.singh@schneider-electric.com) who contributed to this article. Download the paper and learn how to improve operational efficiency of your plant.